Healing & Spirituality | Buddhist economics: oxymoron or idea whose time has come? 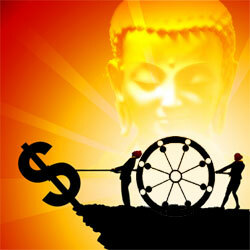 Buddhist economics: oxymoron or idea whose time has come? BERKELEY, CA (USA) -- University of California Berkeley economist Clair Brown acknowledges that “Buddhist economics” may seem like an oxymoron. Nevertheless, she’s teaching a sophomore seminar on the topic this semester — the campus’s second such offering over the past year. Brown said she created the one-unit Buddhist Economics course after students in her Introductory Economics (Econ 1) class expressed frustration with the relentless Madison Avenue message that more is better, economic growth paves the path to a better life and “retail therapy” is a quick trip to nirvana. The idea of Buddhist economics appears nowhere in standard economic textbooks, and Brown could find no such course offering in other top economics departments in the United States. So she relied on recent innovative and broader approaches in economics, including models based on human development and freedom and the exploration of the psychological underpinnings of economic choices. She also looked at ecological models based on sustainability to develop her new course, which is being offered separately from Econ 1. Brown also looked to Columbia University’s Earth Institute, a leader in sustainable development programs headed by economics professor Jeffrey Sachs. In a recent talk at Yale University — titled “Economics and happiness: Can the two reconnect?” — Sachs promoted a process for measuring economic success according to broad-based happiness, rather than the Gross Domestic Product. With that in mind, Brown assembled a more holistic undergraduate economics seminar that compares the basic neoclassical economics model to Nobel Prize-winning economist Amartya Sen’s view of an ideal economy as one that promotes individual freedoms and capabilities. The term Buddhist economics first appeared in E.F. Schumacher’s 1966 essay, “Buddhist Economics,” which is required reading in Brown’s class and is a chapter in Schumacher’s 1973 book Small is Beautiful: Economics as If People Mattered. His writings are required reading in other UC Berkeley courses dealing with technology and poverty, and political economy. The British economist said that applying Buddhist principles to the way an economy operates would produce an economy designed primarily to meet the needs of people. In accord with the Buddhist concept of “right livelihood,” Schumacher called for jobs that are valued for their psychological and spiritual values, as well as for what they produce. He wrote that Buddhist economics also would bring sustainability into economics, while helping the neediest and encouraging citizens to be happy with enough, instead of more. Her students are also learning about the Bhutan Gross National Happiness index that measures human wellbeing, and the United Nations’ World Happiness Report, which was influenced by Sen. And they’re being introduced to ecological economics by UC Berkeley agricultural economics professor – and Buddhist – Richard Norgaard. Brown’s students spend a few minutes in each class session meditating. For several students, meditation is nothing new. Economics major Somin Park, who grew up in England in a Buddhist family, said the only difference from her other meditations has been the classroom setting. Classmate Nicholas Austin said he has practiced meditation since taking karate lessons as a child. As part of the course, students have been engaged in conversation with Tibetan Buddhist priest Anam Thubten Rinpoche, who explained Buddhism’s “Eightfold Path” that is based on right livelihood — or a way of making a living that does no harm to others, interdependence and connectedness, and inner contentment. True Buddhist economics, he told the students, recognizes everyone’s interconnectedness. Rinpoche stressed living a life based on inner values and inner wealth and taking care of those who are suffering or in need. “Wealth is not only your material acquisition,” said Rinpoche, suggesting rejection of modern society’s “grand delusion” in favor of a middle path based on faith, generosity, integrity, wisdom, conscience and contemplation. Brown assured her students that Buddhist economics wouldn’t require a vow of poverty. “Buddha tried to live in poverty for seven years,” but “it didn’t work,” she said.